Stacie Tarpey, 16, started mushing 11 years ago because “my family was into sled dogs before I was born.” This will be her first Jr. Iditarod. She has run the Jr. Yukon Quest and participated in the Arctic Winter Games in Baffin Island, Canada. Stacie is homeschoold in the 10th grade. 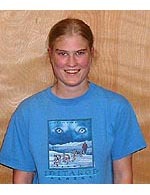 She says in addition to mushing, she enjoys horseback riding and reading. She hasn’t decided what she’ll do after graduation from high school but says she does plan to continue mushing.